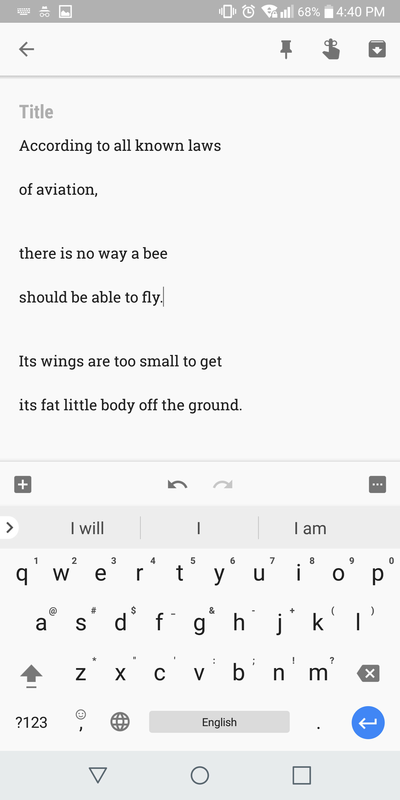 If you've ever found yourself accidentally deleting a bunch of text you weren't supposed to while writing a note in Google Keep (thanks, Gboard! ), you'll know immediately just how great the following piece of news is: the Android version of the app has finally added undo/redo functionality. The feature is visible immediately when you start editing a note, and can be accessed from a pair of arrow-shaped buttons that appear at the bottom of the app screen. However, so far the option is limited to the current writing session only, meaning once you exit a note your writing history is gone. Sure, this is normal functionality in pretty much any text editor out there, ut it's still something to keep in mind when scribbling down a virtual note. The feature is available in Google Keep v3.4.803.02, which should be rolling out to users as we speak. Curiously enough, the functionality isn't mentioned in the Play Store changelog at all, which lists a classic "Bug fixes and performance improvements" instead. Oh, Google. Yes! I specifically emailed them asking to add this in. Google rarely notes any changes in their change-log for anything. Google have some missing features that can be difficult tomotivate why they are missing. Undo/Redo are prime examples. Compared to Evernote (or Everlame) I don't think they lack as much features. They need to make it so you can send and receive Google keep stuff to other people. This is my go-to app for making checklists, but i don't understand why I can't send these lists to my spouse. I wish they would add drag to delete like the flow to remove icons not ( long press on item ), then ( upper right hand menu ) then ( select delete ). It would be much easier to just drag an item over a area after long press to delete.